The initial boot menu was rather strange. I must admit, this may be an issue of Unetbootin, rather than Fedora. In addition to the Unetbootin standard menu item "Default" and explainable menu items for Fedora 17 Live and Fedora 17 Live with simplified graphics, there were items which listed the .iso filename. Hmmm… Anyway, my selection was for normal Fedora 17 Live run. After the initial boot menu, the boot process itself was uneventful. The black splash screen with a small Fedora logo on it changed to the screen with the default wallpaper with full Fedora logo and KDE elements in the bottom left corner. Once the boot process was over, I saw a desktop with the usual panel at the bottom and single folder view. This folder contained only one element - Install Fedora 17. 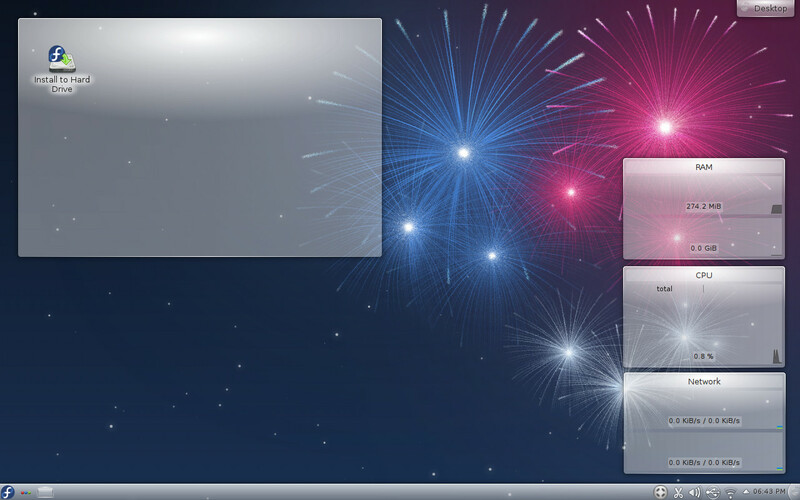 The default and the only wallpaper in Fedora 17 KDE is a picture imitating evening sky in deep-blue tones with fireworks in the top right part of it. The panel at the bottom of the screen has a standard layout. The button with the Fedora logo in the bottom-left corner calls up the Fedora menu in KDE standard Kickoff style. Classic menu style is also available, just 2 clicks away. Next to the menu button, you can find an Activity Manager icon and a switch between virtual desktops icon. Though Fedora 17 KDE only has one virtual desktop by default, you can easily set up more by right-clicking on the switch desktops icon and configuring it. I think this is OK to have the icon on the panel in this case. At least you can easily configure desktops or remove the icon if you don't need multiple desktops. The right part of the panel contains the usual set of elements: clocks, network manager icon, USB manager, volume control, clipboard monitor, Instant Messenger icon, Battery, Printer and Notifications. Some of those elements are hidden by default. Clocks was set to -4 hours, which moved me from London to the East of Southern America or to Canadian Nova Scotia. The taskbar takes the central part of the panel. It has a similar issue with colours as I've seen in Kubuntu 12.04: minimized tasks have a grey font on light-grey background, which makes them unreadable. Some desktop effects are active from the very beginning. They worked well in my Live session of Fedora 17 KDE and I have not seen any abnormalities with them. The freshly booted Fedora 17 KDE operating system took about 270 Mb of memory. 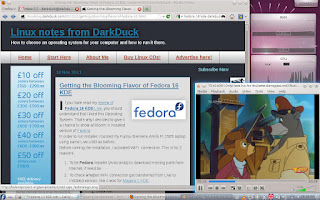 Fedora 17 KDE uses KDE 4.8.3 on top of Linux kernel 3.3.4-5. Fresh enough! Fedora 17 KDE had no issues with recognition and configuring of my wireless network card Intel 3945 ABG. My home network was listed automatically. I only had to type in the security key in order to get connected. It was an easy task in Fedora 17 KDE to configure keyboard layouts as per my own requirement: English UK + Russian with Ctrl-Shift as a switch hotkey. The default layout is English US. This configuration is in its usual place of the System Settings panel: Input devices - Keyboard. In turn, touchpad was not configured to my preference by default. For example, tapping on it was disabled, and scrolling was set up to two-fingers instead of my preferred edge scrolling. This was easily fixed in the same System Settings panel item, just neighbouring the Keyboard section. Fedora 17 KDE Beefy Miracle includes only one browser - Konqueror. This is a good browser... if you only use it for one task: get to the place where you can get a better browser, like Google Chrome or Mozilla Firefox. Though you don't need a browser, even for this task, because Firefox is in the default Fedora repositories. There are plenty of materials on the Internet for how to install Chrome in Fedora 17. In other words, Konqueror is a very basic browser. It failed to show correctly most of the pages I tried to navigate to. Other than Konqueror, the Internet section of the menu contains Blogilo blogging client, KGet download manager, KTorrent, Akgregator RSS reader, KMail, Telepathy messaging client, KRDC remote desktop access and some more. The selection is rather rich, as you can see, and almost all the applications there are KDE- or Qt-native. I tried to use Blogilo, but it failed to connect to my Blogspot-based blog. To be honest, I’ve never seen it working for me. There are 3 sub-sections in the Games part of the menu, and each of them contains one item: Miner, KMahjongg and KPatience. The Graphics section of the menu in Fedora Beefy Miracle KDE, like the Internet section, also contains KDE-native applications like Gwenview, Okular, KSnapshot and KolourPaint. This is not a full list, but you will notice there is no GIMP or any other graphics editor, except for the pretty basic KolourPaint. There is a separate section for Development. Its only item is Akonadi Console. Similar, there is a separate menu section for the System Settings. The Multimedia section of the Fedora 17 menu is not rich: Amarok, KMix, DragonPlayer and K3B are the only representatives here. Calligra Suite, the fork, or continuation if you want, of KOffice, forms the skeleton of the Office part of the menu. There are tools for document editing, spreadsheets and presentations. For example, this blog post was drafted in Calligra Words. This word processor, like its KOffice predecessor, has a unique design. I wrote about it earlier. To be honest, this time round I found myself pretty comfortable in Calligra Words. At least it was OK for simple typing and basic editing, without fancy styles or decorations to the text. Other than Calligra Suite, the Office part of the menu contains KDE-native KOrganizer, KTimeTracker, KAddressBook and some more. Also, there is a menu section for Administration. You can find elements there like Software Manager (Apper), Language, Firewall, Authentication and some more. The System part of the Fedora 17 menu contains a more or less standard set of utilities: Krusader and Dolphin file managers, System Monitor, Terminal, disk burning tool K3B and so on. Similar items can also be found in the Utilities section. For example, Krusader is in both sections. Also, Utilities includes Ark archive manager, KJots, KWrite, and so on. As you can see, Fedora 17 KDE is, pretty much, a well-packed Linux distribution. It does not mean that I am happy with all the chosen software, but at least you have something to start with straight away. If you want to add or replace something, then you will need to use a Software Management tool, which is Apper, in the case of Fedora 17 KDE. What is in the default repository for Fedora 17? Even though some of the above listed applications are not in the default repository, Fedora is well-known for the community based software repositories. It means you're very likely to find your application easily. Just to test the installation process, I installed Firefox and Qutim, my favourite Internet Messenger, from the default Fedora repository. The installation process was smooth, although it included some steps to update existing packages and install dependencies. A nice touch in the Apper: it lists installed applications at the end of the process and allows one to launch them straight away. However, one not so nice aspect is that Apper does not show the size of packages in the list of dependencies: neither size to download, nor installed size are available. Another option to install applications in Fedora is using the command sudo yum install <package>. I used it to install the file manager Midnight Commander (mc), and it worked without any issues for me. Fedora 17 KDE includes KNetAttach utility, which can be used for connecting to remote folders. I tried to use it to connect to the shared directory on my home fileserver. KNetAttach managed to make a connection, but only listed an empty folder. As an alternative to KNetAttach, I managed to mount my network partition using the command sudo mount -t cifs. Before doing this, I had to add the user liveuser into the sudoers file. Mounting went fine. No errors arose. It means that the Samba client package smbfs is in the default Fedora 17 KDE distribution. Unfortunately, the manual mounting did not help: I still could not see the contents of my remote partition. Neither Dolphin, nor MC were able to help. Obviously, I could not playback anything from the remote partition. I simply could not navigate to the files stored there. Instead, I tried to play back audio and video files from the local disk on my laptop. Amarok, the default player for MP3 files, presented me again with the same annoying question about my location. It wanted to connect me to the Amazon music store. But, at the end of the story, it refused to play my MP3 file. Default Fedora 17 KDE comes without necessary plugins. You can install them from the 3rd party repositories, like I have already explained in my Fedora 16 KDE review. Same story with video codecs and the Flash player: neither of them is in the Fedora 17 default distribution. After activation of RPMFusion repository, I tried to install VLC player. This time, like last time with Fedora 16, the installation did not go well via Apper. It stopped at the phase "Waiting for service to start", although the installation itself was successful. VLC resolved all the issues with multimedia support: both video and audio files played OK in VLC, although they still did not play in DragonPlayer. Maybe because of this semi-finished installation of VLC, maybe for another reason, I could not install the RPM file for Adobe Flash Player. As a result, I was not able to play back the Flash videos during my Live run of Fedora 17 KDE. Unfortunately, Fedora 17 KDE was not so good at the shutdown process. The Live session left me with a switched on laptop, showing the Fedora logo in the centre of the screen. It did not recognise any keys, except for the Power button. Fedora 17 Beefy Miracle KDE behaved itself pretty well during my experimental Live run. It did not crash at any point in time. Honestly, I felt some slowness, but only when installation of packages ran in parallel with other tasks. Of course, there are some things which I'd improve to accommodate my own taste, especially in the selection of default software. But, generally speaking, the default distribution is well-packed. Unfortunately, it is a Fedora policy not to include non-free codecs and packages like MP3 plugins or Flash player in the distribution. But all these issues are easily resolvable. Other major issues that I’d like to mention is my inability to connect to remote network partition and to install Flash player. I believe both these issues can be resolved, especially on the installed operating system. Adding to this that Fedora, being one of the most popular Linux distributions, is well-documented and has lots of dedicated on-line resources. It can be easily recommended, from my point of view, to users of any level: from newcomers to gurus. But, unfortunately, at the same time I need to note that, from my point of view, Fedora 17 KDE is worse than version 16 of the same operating system. I encountered more issues running this release in Live session, than I did before. Does it mean that Fedora is in decline? Or is it only a temporary obscuration? Have you tried Fedora yet? If not, then why not order a CD with Fedora 17 from the site BuyLinuxCDs.co.uk. I give Fedora props for having a "pure" KDE edition. Often you'll see a distro that offers KDE, but with GIMP or LibreOffice - and no Calligra Suite. Fedora doesn't do this. I agree with you that Kongueror is a mediocre browser, but otherwise, for KDE fans this is definitely a good choice. In fact, it installs 3 pieces of Calligra, while the main Fedora (using GNOME 3) doesn't install any office suite at all. Agree. It's better to have Calligra office than no office suite at all. So, respect to Fedora KDE team. I really love the new version of Fedora KDE. It's very fast and up-to-date and I like it a lot how KDE is in its default/vanilla form. I guess if they replace Konqueror with WebKit-based Rekonq web browser it could be almost perfect. Sure, Rekonq is much better than Konqueror. I saw it in Kubuntu 12.04 and was really impressed. By the way, if I weight Kubuntu vs Fedora, than Fedora will win. I've not used Fedora 17 nor the KDE version but Fedora 16 was very quick with regards to boot time. Is that still the case? I wonder with Fedora whether it is a system where it will be the base of many spin offs and re-spins as it the case with Ubuntu. The stability that both Ubuntu and Fedora offer is great but because people require different things and the default options are not to their liking the likelihood is that people will build systems based on these distributions and not use the base systems at all. Debian is a great example of my point. It produces loads of spin offs but how many people use the base system? Gary, Fedora is already a base for quite a lot of derivatives. Although, the number is smaller than for Ubuntu. In terms of boot speed, I have not noticed anything worse or better in Fedora 17 compared to v.16 or majority of other distributions. It's average, IMHO. I never heard that you could install/update applications in a live CD session. But don't you think it could explain some of the problems that Fedora 17 KDE was not actually installed on the hard disk? Yes, usually you can install applications in Live run. Most of the distributions have no problems whatsoever with this. Not necessarily USB only. You can install applications in LiveCD runs too. Of course, only until the reboot. Very good review. I've been a Debian user for nearly 20 years and tried Fedora for the first time back with release 16. I'm not much into Gnome and KDE and have used Xfce and Openbox for the past, well, not sure how many years. I'm currently running the Xfce version of Fedora 17 and have been pretty happy with it. I did, however, try the lxde version and wasn't all that impressed. I was going to write a blog entry about my experiences with the lxde release but just haven't found the time. I installed Fedora 17 on a 120 gig partition and used it full-time for about a month. Worked really well. Much More responsive than Kubuntu or Netrunner, but smaller application pool. I was not able to replicate my Ubuntu environment completely. The only problem I had was the on again/off again access to my Ubuntu home partition where most of my work files are kept. I also had problems running Java apps like Aptana Studio. Perhaps, like Debian stable, you lose system robustness when you add the multimedia repositories. AND I could find no safe way to update to KDE 4.9. Reading the review, and seeing what is not in the repos, I am happy enough running a Debian-based system to switch to the other, although Debian didn't have pan in the repos. The best thing about Ubuntu is Launchpad with its easily-installed PPAs. It's what's available in the repos, and Ubuntu's is pretty complete. Add the GetDeb PlayDeb repos and you have 99+% os what you're looking for. As current, Fedora 18 KDE spin has been made the best ever release. Adding rpmfusion and for better font rendering (much better then Ubuntu's) Infinality will create you best Desktop experience. Most of us love it because of simplicity, even more loved by developers as it's made for them (maybe this is why consider it not so user friendly). Madalin, do you want to write a review of Fedora 18 for a wider public?